ZIMBABWE – Suspended Zanu-PF officials and infiltrators will not be allowed to attend the 15th Zanu-PF Annual National People’s Conference which will be officially opened by President Mugabe here today, national commissar Cde Saviour Kasukuwere has said. In an interview yesterday, Cde Kasukuwere said the party would not hesitate to expel or suspend undisciplined cadres causing confusion in the party. This comes after the Zanu-PF Central Committee on Wednesday expelled three former officials, suspended two others for five years, while another quartet was suspended for five years. Those expelled were Mr Sylvester Nguni, former Minister of State in expelled former Vice President Joice Mujuru’s office, Christwell Mutematsaka (Mashonaland Central Committee member) and Batsirai Musona (Mashonaland Central provincial secretary for security). Suspended for five years were Godfrey Tsenengamu (Mashonaland Central youth chairperson) and Paul Rwodzi (Mashonaland Central youth secretary for administration). Cdes Chiratidzo Mukarati, (Harare chairlady), Goodwills Masimirembwa (former Harare chairperson), Happiness Nyakuedzwa (Manicaland provincial chairperson for the Women’s League) and Danny Musukuma (Harare provincial secretary for legal affairs) were suspended for two years. These join hordes of other officials expelled and suspended from the party this year after it was discovered that they were working with a cabal led by Mrs Mujuru, which was angling to topple President Mugabe. Cde Kasukuwere said because of indiscipline, the suspended members would be watching the event from the terraces as they were not tolerated anywhere near the venue. In any case, he said, there would be tight security to deal with any gate crashers. 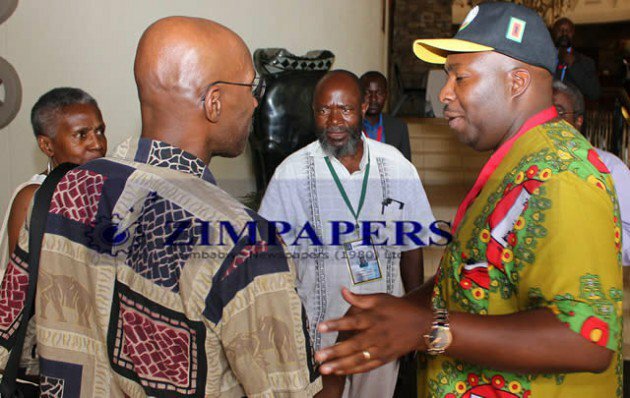 Mr Musona and Cde Tsenengamu are some of the suspended Zanu-PF members who arrived in Victoria Falls yesterday with the intention to attend the conference. “Delegates who are coming from the provinces must be bona fide delegates,” said Cde Kasukuwere. “Security will be tight from tomorrow morning and we will not allow those not accredited, MDC or People First infiltrators. “We can’t allow imposters who are coming on a fishing expedition. What matters is to be disciplined because we know that even if we expel you, you still do not want to miss Zanu-PF events. Because of indiscipline, they will now be watching from hotels nearby. We must respect decisions of the party. Cde Kasukuwere said the party would continue weeding out errant members bent on creating disunity as a way of ensuring that discipline prevails. Cde Kasukuwere warned members who habour ambitions that destabilise the party to keep them to themselves, as the party would not hesitate to take action. He said in terms of the economy, the Zanu-PF Government was making headway to fulfill most of the election promises made to the people during the 2013 harmonised elections. “The political machinery is moving and if it moves like a juggernaut you cannot stop it,” he said. “The people’s belief in the leadership of President Mugabe and the party has grown tremendously and we want to ensure the objectives of the party to deliver better services to the people. Cde Kasukuwere said the conference came at a time the party’s Look East Policy has been vindicated following the recent visit by Chinese President Mr Xi Jinping, who together with President Mugabe witnessed the signing of 15 landmark economic deals worth about $4 billion dollars. He said the completion of the airport road in Harare and the Victoria Falls International Airport were evidence of the growth and development taking place in the country. On the yet to be fulfilled 2013 electoral pledges, Cde Kasukuwere said job creation was not a one day event, but a process. “We can’t expect that in one year we would have created 2,3 million jobs,” he said. “When we talk about 2,3 million jobs, we are also talking communicatively of what the economy can do. Cde Kasukuwere said the party had increased its support bases as evidenced by the expansions from 2 900 to 3 000 districts across the country.